Nothing quite says fall like all things pumpkin. Everywhere you look, the world is decorated or flavored with pumpkin & I for one love it. We already made our first pumpkin pie & will be going to pick some pumpkins week. We even broke out some of our favorite fall books of the season. We recently discovered the book, ‘Too Many Pumpkins‘ It is a wonderful autumn book about a woman who hates pumpkins because it was all that her poor family ate when she was younger. She finds herself with a big problem when a pumpkin fall out of a truck and into her yard & begins to grow a patch. She decides to ignore them, but finds that ends up being harder than she thinks. It is a sweet story with a lovely ending and has become a new favorite of ours. All those pumpkins inspired us to make too many pumpkins of our own. 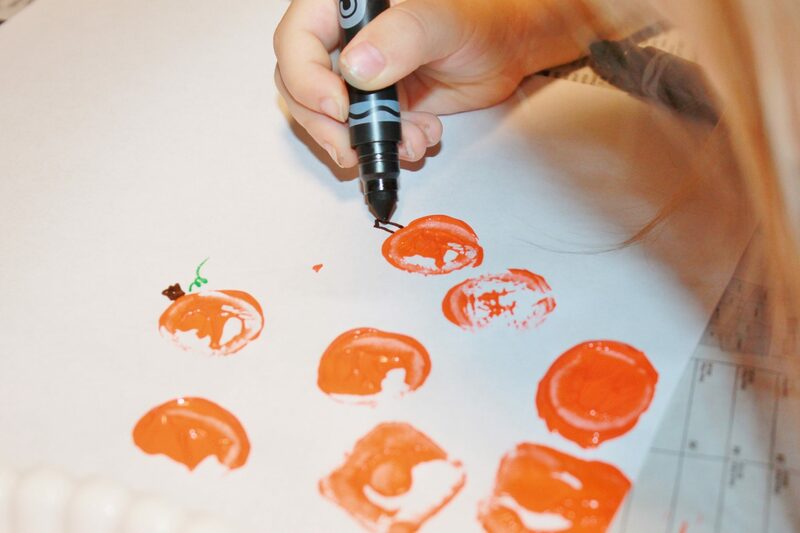 We love making paint stamps out of different materials. Also, check out our potato stamped jack-o-lanterns. 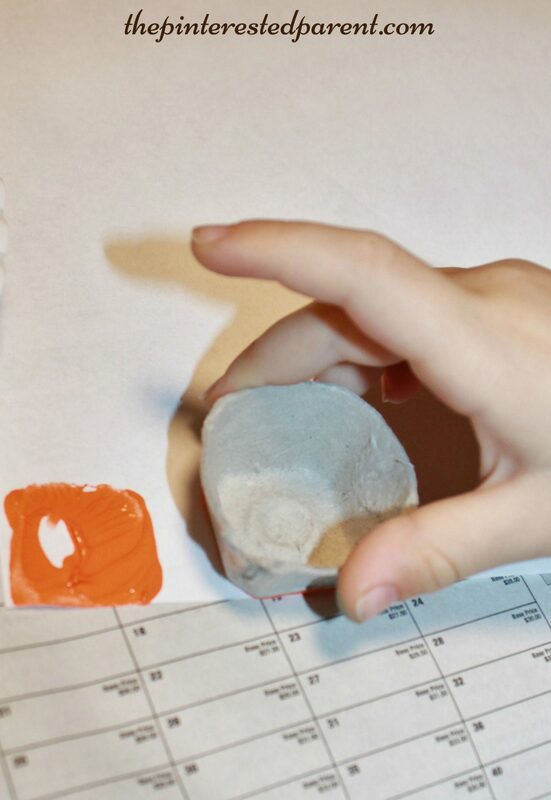 While painting some egg carton pieces for a project the other day, we discovered that they also make great paint stamps. 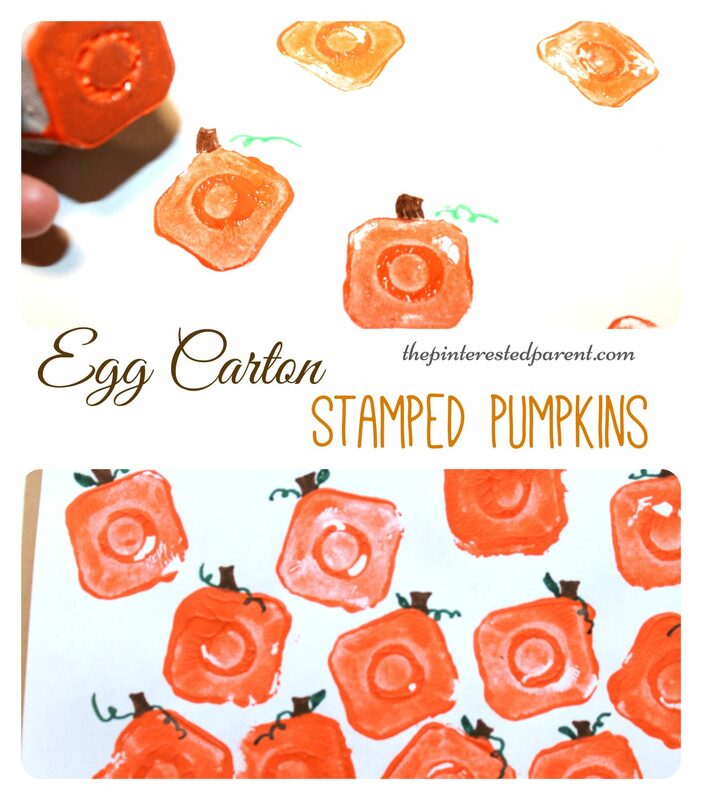 We made pumpkin stamps out of our egg carton pieces. Here’s how. Egg cartons come in different shapes, some round, some more diamond-shaped. We cut a few different shapes of egg carton and tried them out. 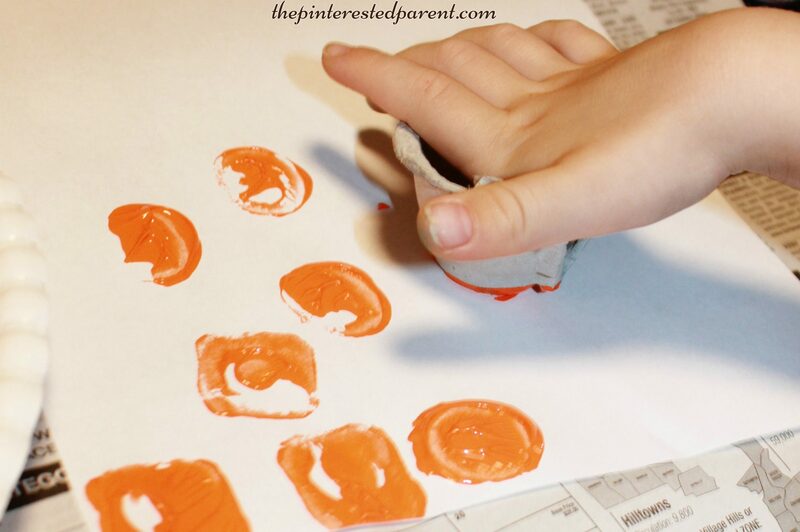 My daughter squeezed orange paint out onto a paper plate. I spread the paint out across it to make for easier stamping. 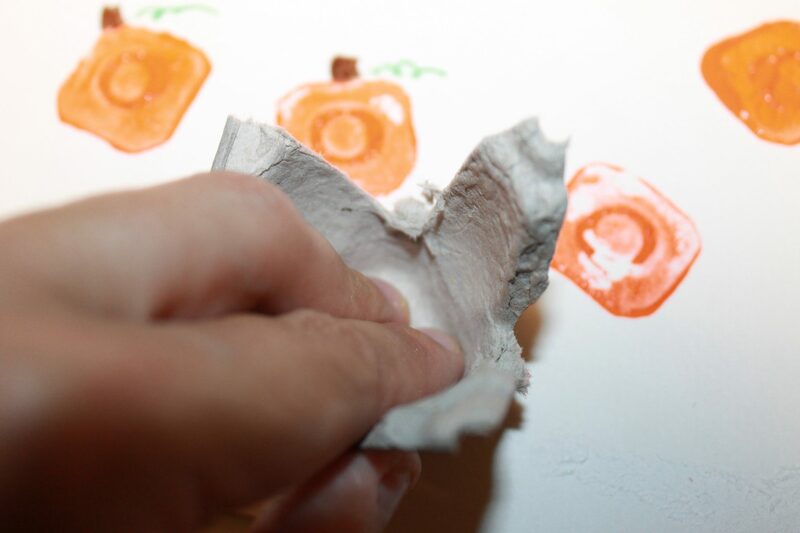 We simply dipped the egg cartons into the paint & then pressed them firmly onto a piece of paper. Just like with any stamping project, if you do not press firmly, the stamp will not show up. Our first egg cartons, we cut so they were nice and evenly cut, but we learned that they are easier to use if you leave the spiky part attached. We tried both round and diamond-shaped egg carton pieces. The round looked more authentic, but did not stamp as nicely. 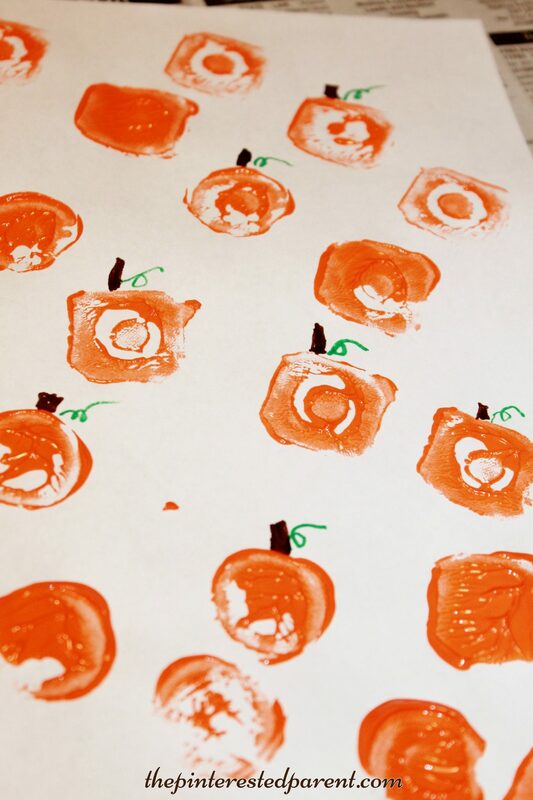 When we were done stamping we used our markers to draw in the stems & vines to finish off our cute little pumpkins. 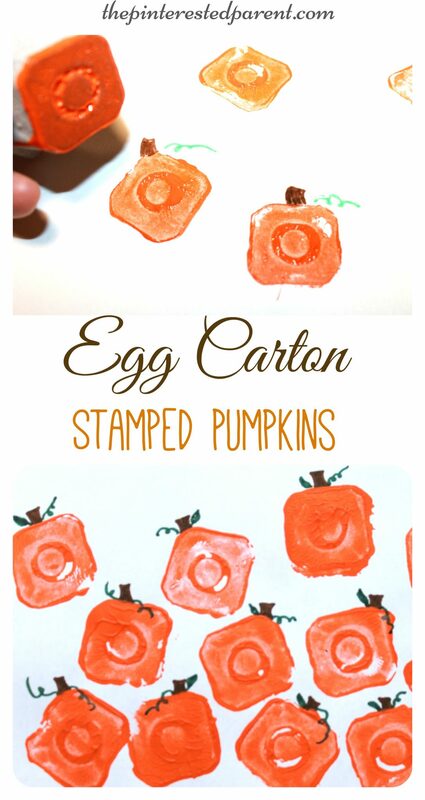 These were so simple & made an adorable pumpkin patch. Check out some of these wonderful pumpkin themed books as a companion to your craft.